If you think that hand wrapping is a better alternative than stretch film machines, think again. In fact, a stretch film machine offers the most cost effective, fastest and safest way to your packaging needs. When you use a pallet wrapping machine, you avoid using too much pallet wrap because the machine stretches the film to the extent that is accurately required. Also a pallet wrapping machine will help to ensure all loads are wrapped with the same tension, making the load more secure. Pre stretched film can help you save money because it has long stability and strong physical energy. Because pre stretched film has a unique and smooth consistency, it is considered one of the best wrapping materials. Moreover, it also protects the loads better than traditional wrap. Another issue that can cost a company a lot is training the employee on how to correctly wrap the loads to ensure customer satisfaction while avoiding any injuries. There is a right way to wrap a pallet with hand wrap. Applied incorrectly, hand wrap may crush the product or allow the product to shift during transport. Pallet wrapping with a stretch wrap machine eliminates this issue. Using a stretch wrapping machine is easy and it requires little or no training at all. All it takes is pushing a button. As we all know time is money and there is no denying that pallet wrapping machines are faster and more efficient than hand wrapping. The speed is impressive -- the machine moves several times faster than hand wrapping, and the standard results are excellent. When you wrap a pallet using high performance stretch film, the wrap machine delivers a clean professional finished product. Hand wrapping leaves the pallet looking erratic and messy. Do you want your pallet to have a professional look? With a stretch wrap machine all this is made possible. If an operator wraps pallets by hand, you can be sure that the wrap will not be exactly the same, time and time again. A load wrapped by one operator on Monday will not be wrapped the same way as another operator on Friday. Pallet wrapping with a high performance stretch film machine solves the problem. If your employees are hand wrapping, you should be concerned about their health and safety, because there are several injuries associated with this repetitive procedure, including: chronic back, shoulder and wrist pain. In addition, there are many accidents caused by hand wrapping pallets. You know these types of injuries can endanger the life of your employees, and cost the company a lot of money and loss. It takes around 4 minutes to hand wrap a pallet; imagine the number of pallets needed to be wrapped by a single worker on one working day. This poor posture and repetitive awkward motion can cause permanent back injury. This is why wrapping pallets with a machine is strongly recommended in order to eliminate the high risk of musculoskeletal injuries. Pallet wrapping with a stretch film machine wraps the same way every time so it reduces the potential of a pallet being damaged during transportation, and increasing customer satisfaction at the same time. Besides these five reasons, pallet machines are incredible versatile. There are ones for small production, semi-automatic stretch wrapping, and fully automatic pallet machines, making them compatible with every production line. 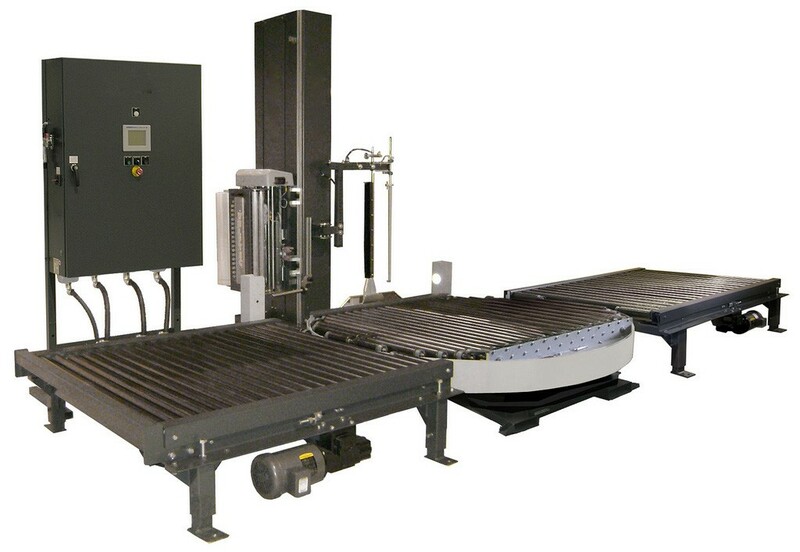 So look for the pallet wrapping machine you need, jumpstart work efficiency and reduce potential damage and loss.